As much as I'd love to share all of my work with you, some projects are shrouded in a cloak of confidentiality. So here's a little taste of what I can do, with a range of writing styles, formats and clients. Have a little read, then tell me about your upcoming projects and we'll get the conversation started. Ombar is a UK-based raw vegan chocolate company. As part of their brand refresh, I worked with Ombar to write new website copy and marketing materials, and to conceptualise the names and on-pack marketing for their new range. Working with Agency AnalogFolk, I developed a series of content pieces for their client, BT TV. To generate interest and curiosity in three new series, Kimmy Schmidt, Primal Survivor, and The Joy of Techs, these pieces were written in article format to provide background/additional detail. Tideford Organics. Food, Advertising, Print. 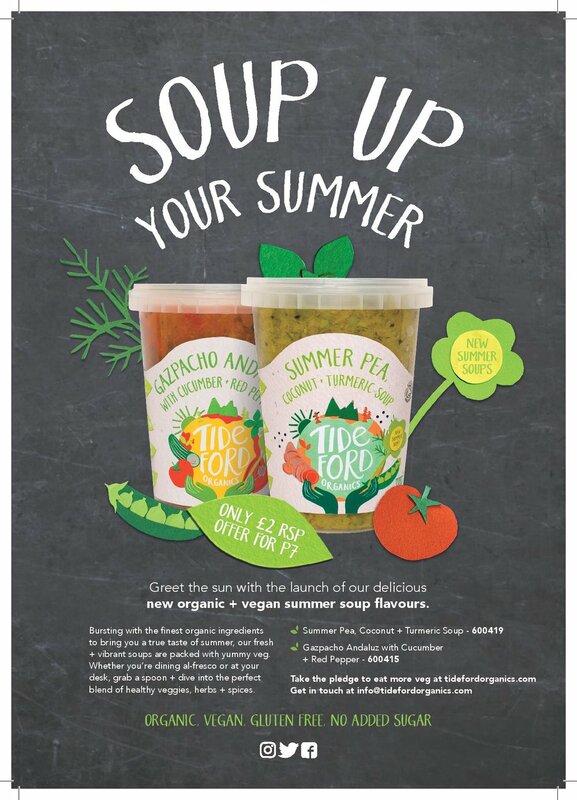 With the release of their new range, Tideford Organics needed a way to entice people to think of soup as a summer meal. This particular concept was used to advertise Tideford’s new flavours, drawing on the brand’s lighthearted tone. Ombar is a UK-based raw vegan chocolate company. 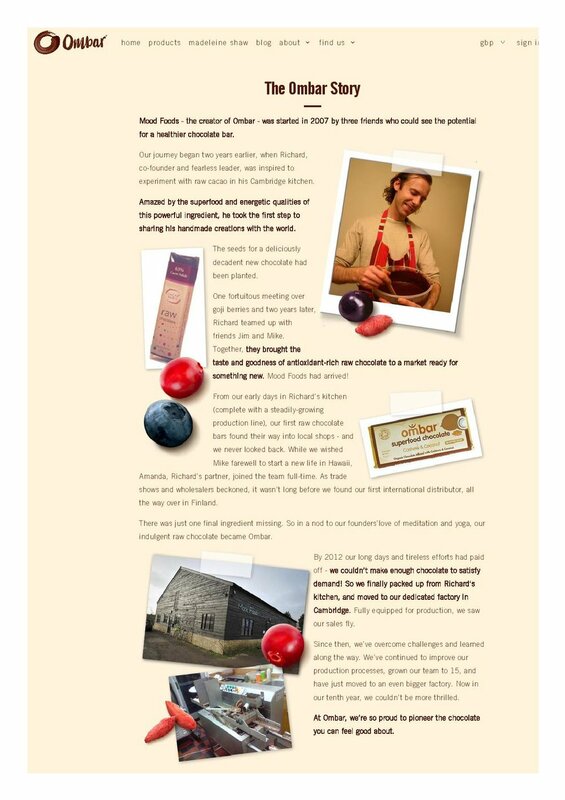 As part of their brand refresh, I worked with Ombar to write new website copy, including this re-work of their story. It's not often you get to work for a brand you love and have free reign on the brief... so I was thrilled to work with ethical footwear brand, Nicora, on their new content strategy and write a piece about my experience with their beautiful handmade shoes. Free-From Magazine. Lifestyle, Print, Digital. Over the course of a couple of years, I worked with titles in the 'Free-From' magazine group to research and write articles (print and online), and work on food-related content to seasonal briefs. Gibbons Co. Property, Digital, Website. Gibbons Co. is a luxury property developer in New Zealand. To advertise the sale of properties new to market, I worked on the copy for the client's new website and developed the tagline ‘Bringing you sunshine’ to reflect one of their key offerings.